Sightseeing places covered - Qutub Shahi Tombs, Golconda Fort, Charminar, Chowmahalla Palace, Salar Jung Museum, and Lumbini Park at Hussain Sagar Lake. Hyderabad, a city that presents a beautiful blend of cultural heritage, historical richness and latest development and modern amenities, is a place worth exploring. Presenting a glimpse into both the world, bygone and the present, Hyderabad allures every travel lover. At Holidays DNA we offer a hassle free way of exploring this unique city with our Hyderabad city tour package- Full day. Now, visit all the popular places in Hyderabad in a single day without any stress of arrangements, booking and timings. In this Hyderabad city tour package, we offer a cab for sightseeing which takes you to the pre-planned set of sightseeing places at a reasonable cost. Lunch 30 to 45 minutes. Please note that Lunch is not Complimentary and Not Included in this package. Suggested Restaurants: Hotel Shadab (Ghansi Bazaar) or Hotel Sandarshini (Masab Tank). Plan to finish lunch by 1:45pm. Hyderabad City Tour Quick Guide- What you see? Hyderabad, the historical city with a rich cultural heritage is undeniably one of the best travel destinations in the world. A tour to Hyderabad presents a wide array of captivating sightseeing places, varying from museums, to places to lakes and gardens. Below is the list of sightseeing places included in the Hyderabad city tour package. Must See / Things to Do: Seven tombs of the Kings of Qutub Shahi Dynasty royals, constructed amid a peaceful garden. Tomb of Sultan Quli Qutub-ul-Mulk, the founder of Qutub Shahi Dynasty. Largest tomb of Mohammed Quli Qutub Shah- with height of 42 meters in height and 28 open arches. One of the popular tourist attractions in Hyderabad, Qutb Shahi Tombs are seven in number, located amid a beautiful landscape garden. These are the tombs of the kings of Shahi Dynasty. These tombs are of varying sizes ranging from two storied to single storied, the tomb of 5th royal of Shahi dynasty- Muhammad Quli Qutub Shah is the largest of all with a height of 42 meters and 28 open arches. Presenting a blend of Persian, Indian and Pashtun style of architecture, Qutub Shahi Tombs are indeed mesmerizing example of architectural excellence. Must See / Things to Do: Acoustic system at Fateh Darwaza. View from the highest point - Bala Hissar, Rahban' cannon. Ramdas’ prison with carved Hindu deities on the wall. Captivating green lawns at the backdrop of majestic ancient fort. Light and sound show in evening. A magnificent fort with eight majestic gates and 87 bastions, Golconda Fort was built by Qutub Shahi Kings. However, the origin of the fort can be traced back to Kakatiya reign. The fort is surrounded by walls of 15-18 feet high. Along with its impressive architecture, its system of acoustics is also worth noticing. It is also the place where the prestigious Kohinoor and Hope diamonds along with Regent Diamond, Darya-e Nur, Nur-Ul-Ain Diamond were kept. Another attractive feature of Golconda Fort is the multilingual sound and light show in the voice legendary actor Amitabh Bachchan. Must See / Things to Do: Indo-Islamic architecture. Intricate carving of the monument. 20 meters high pillars on each corner. View of the Laad bazaar and the surrounding area from the top. Charminar, an alluring amalgamation of Indo-Islamic architecture is one of the most famous tourist attractions of Hyderabad. Built in the honour of his wife Bagmati, by Sultan Mohammed Quli Qutb Shah in 1591, Charminar is intricately carved square structure with four exquisite minars (pillars) on each side. It is also said Qutb Shah has prayed for the end of plague at the very place where Charminar stands today. With a height of 56 meters and width of 30 meters, it has been built with limestone, granite, powdered marble and mortar. On the top floor of Charminar there is a mosque. Must See / Things to Do: Elegant architecture. Grand durbar hall- Khilwat Mubarak. Khilwat clock functioning since the time of construction. Council Hall, Shishe-Alat, Bara Imam, Roshan Bungalow. Built in 18th Century, from a period of 1750 to 1869, Chowmahalla Palace was the seat of power for Nizam rulers, the Asaf Jahi Dynasty. Though, the major completion of this palace was done during the reign of Nizam Salabat Jang, architectural influences of other reigns can also be seen. Originally spread over 45 acres of land, the palace now covers 12 acres, constituting of two courtyards. The Southern courtyard of the palace houses four palaces- Afzal Mahal, Tahniyat Mahal, Aftab Mahal and Mahtab Mahal, while the heart of the palace was used as durbar halls, called as Khilwat Mubarak. The palace also has exhibition of various vintage cars, including the Royal Royce, which was used as a dustbin by the Nizam royals. Must See / Things to Do: One of largest one-man collections of the world. 38 galleries in 2 floors. Marble statue- Veiled Rebecca, Rehal, the jade books stand, a dragger of Jehangir, 19th Century British Musical Clock, set of ivory chairs belonging to Tipu Sultan, etc. Boasts of being the third largest museums in the country, Salar Jung Museum is an important part of every Hyderabad tour. Spread over 10 acres of land, this museum is a personal collection of Nawab Mir Yusuf Ali Khan Salar Jung III. Artifacts belonging to Nawab Turab Ali Khan (Salar Jung I) and his descendants have also been kept at this museum. Salar Jung Museum is home to more than 9000 manuscripts, 47000 printed books and 43000 art objects which have been displayed in 38 galleries in 2 floors. Tipu Sultan’s wardrobe, Emperor Jehangir’s Dagger and Emperor Aurangzeb’s sword are a few of the popular exhibits at the museum. Built in 1562 during the rule of Ibrahim Quli Qutub Shah, considered to be one of the largest artificial lakes in Asia, Hussain Sagar Lake was used as source of water for irrigation and other purposes. 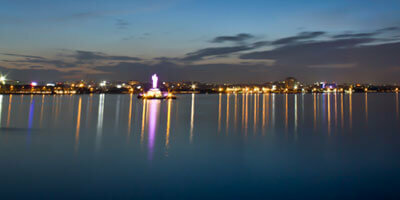 Now a popular recreational place, this lake adds a refreshing touch to Hyderabad tour. The massive standing statue of Lord Buddha in the middle of the lake is another captivating sight at the lake. Lumbini Park, presents a mesmerizing view of the lake and the Buddha statue. Developed in 1914, this park presents lush green gardens to sit and relax along with the facility of many water activities. Boating from Lumbini park to the Buddha statue is quite popular along with the laser show. 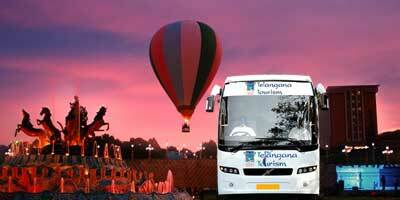 The Hyderabad city tour package charges are applicable only for pick and drop from one location. If in case, there are multiple pickup and drops, there will be additional charges. Additional charges will be added if in case the vehicle is held for more duration or beyond the time mentioned in the package. Also in the case of any deviation in the presented itinerary, additional charges will be applied. For Indica Non-Ac, Rs.9/km and Rs.80/hour. For Indica Ac, Rs.9/km and Rs.90/hour. For Indigo, Rs.14/km and Rs.100/hour. 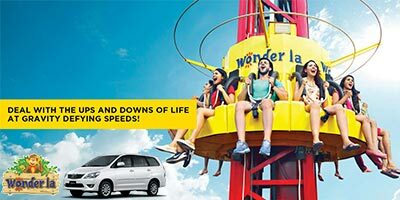 For Innova Ac, Rs.18/km and Rs.125/hour. For Tempo Traveller Ac, Rs.18/km and Rs.150/hour. For Tempo Traveller Ac, Rs.20/km and Rs.200/hour. 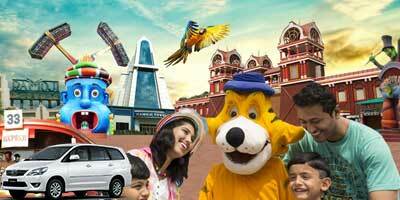 Guests are requested to follow the itinerary provided in the Hyderabad city tour package. 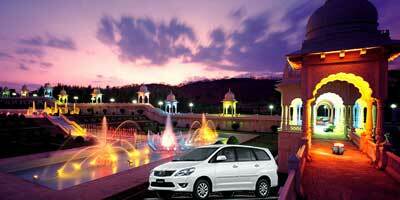 Hyderabad city tour package is not customizable. The time spent on each tourist attraction is to be followed as per the schedule. In case of delays or extended time spent at a particular place, driver or Holidays DNA will not be responsible to cover all the places mentioned in the itinerary. Kindly note that if a particular sightseeing place is closed on the scheduled day of the tour, it will not be covered from list of sightseeing places.